“According to Carnegie Melon[sic], only one book has been distributed in more copies than the Bible — the Ikea catalog.” First appeared in The Daily, University of Washington’s student newspaper, the thought-provoking quote surely reminds us of the sheer volume of Ikea catalogues that circulates around each year: 200 million. With its motto of ‘creating a better everyday life for the many people’, Ikea has focused its effort on producing customer-centered content marketing to get its message across. The Ikea catalog has been the cornerstone of its prolonged marketing effort. But Ikea’s modern marketing approach has also ranged from witty Facebook campaigns to YouTube tutorials and emoji marketing. How did Ikea climb up the ladder to become the only one furniture retailer with an impressive number of followers? The ‘’bookbook’’ promo, one of its most witty campaigns, may still be fresh in your memory. Released in 2015, IKEA reassured its confidence in the good old printed catalog by skilfully suggesting that prints are not dead through this parody of Apple’s iPhone 6 announcement. Originally published by the IKEA Singapore on YouTube channel, “It’s not a digital book or an e-book,” said Jörgen Eghammer, IKEA’s “Chief Design Güru.” “It’s a bookbook.” Thanks to its sarcastic tone, the video went so viral that it eventually succeeded in representing IKEA’s global brand. The result was a whopping 12 million YouTube views. Nonetheless, IKEA is not a hater of technology. As a matter of fact, it was probably the first furniture retailer to have incorporated the latest technologies like augmented reality to help customers make the right purchasing decisions. It was back in 2013, when IKEA rolled out a catalog app feature called ‘Place in Your Room’ that allowed users to try out their desired products in their homes. As the research has shown that almost ‘14 percent of its customers end up taking home furniture which turns out to be the wrong size for its intended location’, the feature allows 360 degree room views and videos to help customers find out the best matching products. One thing I love about this global brand is that it often gets a grip of its highly fragmented market. How to connect with everyone in the face of highly segmented customer groups? – Leverage on a localised approach. IKEA faced countless hiccups when it first made it to India and China with their ‘global’ products. But it has certainly learned the lesson. IKEA’s localised marketing strategies are well aware of the need to add a distinctive twist to make the brand more relatable. For instance, IKEA Taiwan came up with a witty idea to use ‘hotpot’ – a special dish that brings families and friends together in Asia – to create an unforgettable customer experience. The campaign brings out a salient point to family dinner tables: the lack of meaningful conversations as everybody is just too busy checking their smartphones. Solution: A hot plate that will only turn on when there are enough phones under it. Outcome? Real human interaction and great customer experience. Not to mention that it generated a buzz too. IKEA also takes a bolder approach when it comes to ambient marketing. It’s ‘Moving Day’ marketing stunt in Quebec caught passerby’s attention with free boxes of moving, printed with moving tips, checklists, a dinner offer for those yet to set up their kitchens, and a discount offer for IKEA furniture. (Free cardboard boxes were exactly what I needed the most when I moved from one city to another!) The result? Store traffic increased more than 14% from the same weekend the previous year, whereas sales increased by over 24.5% than the previous year (Read more at Guerrilla Cheese Marketing). 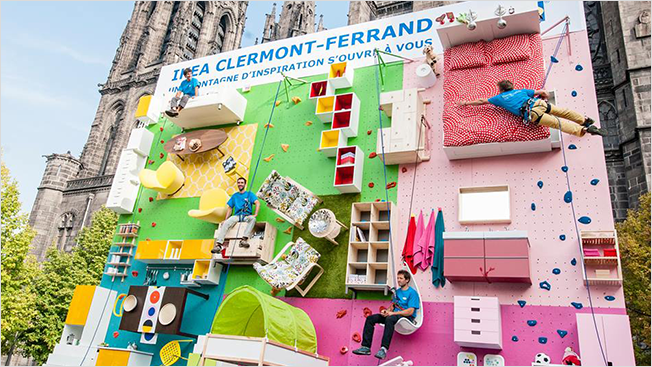 Now here is another incredible example: IKEA France, to celebrate the 30th store, installed a vertical outdoor apartment billboard which was then turned into a climbing wall. How amazing is that? It wonders me why IKEA is so skillful at doing viral videos. From cats to family-themed content, their YouTube videos appeal to a wider audience. But IKEA’s marketing teams are not the only force behind the scene. If you’re familiar with IKEA furniture, then you’d be also familiar with a lot of DIY IKEA videos posted by fans/customers on YouTube too. From useful ‘How To’ videos to a comedian moving into an IKEA store and ‘Dead Drunk but Trying’ series (literally drunk dudes trying to assemble IKEA products), you’ll find a variety of user-generated content featuring IKEA products on YouTube and Vimeo. Personally, one of my favourite viral IKEA campaigns on YouTube is this one during Halloween in 2014. By now, you might agree with me that the underlying ingredient of those witty campaigns. It’s quite simple: they listen. They don’t just pick consumer information from standard surveys and questionnaires. The brand actually sends design experts to people’s houses to listen to their needs, complaints and concerns. They really try hard to understand their customers to create the right tone of voice and make the brand more relatable to the everyday life. The feedback, in return, allows IKEA’s marketing team to focus on building effective strategies based on people’s real-life experiences. Women: A Missed Opportunity in Video Games..